Ballymena United Academy sides found it a frustrating weekend as both the under 14’s and under 16’s lost out in their home fixtures. The 14’s faced an excellent Ridegeway Rovers side who played some top football and edged home past an injury hit Sky Blues. The under 16’s were hopeful of a win against close league rivals Lurgan but were disappointing as the Armagh side were rarely troubled at a sodden Showgrounds. The under 15’s lost out to Limavady on Friday night while there was some postives in an understrength under 11’s putting on a good performance in Lisburn. The under 17’s are impressing at present and had a great derby win away to Coleraine to go four points clear in their National “B” league. This Saturday the National cup kicks off, the under 16’s are in action against Donegal Celtic and will be hoping to progress. The under 14’s face Carniny in another eagerly anticipated league derby. BUYA 2, Hillsborough 2: The exam season has kicked in and United were missing a few players. They took ten minutes to settle into the match went a goal down, then a great strike from Callum Douglas got them back into the game.Hillsborough scored from a free kick to make it 2-1 before half time. Second half Ballymena got into their stride and played some superb football,a great free kick from Noah Scullion made it 2-2 and some good saves from the Hillsborough keeper kept the score level. BUYA 1, Ridgeway Rovers 3: The visitors grew more into the game and a quick break down the wing and a crossed ball led to Ridgeway taking the lead. Just before the break they added a second. The second half was more of the same with Ridgeway having more of the ball and Ballymena having to work hard to get it back. With good work through the midfield from Ross McCausland and the excellent Sean McAllister who finished superbly from the edge of the box. Ballymena tried hard to draw level but Ridgeway added their third. Limavady Youth 7, BUYA 2: The 15’s missed chances early on in this game, something you cannot do in this National “A” league, and so it was to prove costly. It was a poor defensive display from United, something they can and must improve on. Their highlight was a superbly taken Johnny Patterson chipped effort in the second half of this game. 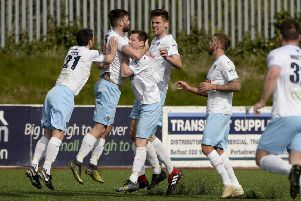 Ballymena United 2, Lurgan Town 5: The unfortunate Josh Galloway departed injured which would prove disruptive for the sky blues but it was a lack of intensity in key positions which was the ultimate downfall. Andrew Smith worked hard and flicked home well as the game could have went either way. A superb Ronnie Marshall long range effort was the only other highlight here for United who will hope to progress in the cup next week and have some key players back from suspension the following Saturday. Coleraine 2, Ballymena United 4: United got off to the perfect start when Philip Maybin capitalised in the Coleraine defence to put the skies 1-0 up. Owen Best in the Ballymena goal made a great save before Coleraine equalised with a shot from distance. Ballymena went in front again when Philip Maybin vollyed home to score his second of the game. Coleraine equalised again with another shot from distance. Before half time Michael McCabe put Ballymena ahead again with a shot from close range. The sky blues controlled large parts of the second half and Isaac Dunne made it four when he headed home an Adam McCelland corner.